The Native American Cotochese who lived along the shores of three sheltered bays off Nantucket Sound named them chunkoo, or chunkomuck, skunkomug, or skonkonet. But, no matter what they chose to call them, they pried open the crinkly white shells and found exactly what they were looking for, oysters. It did not take long for the first colonial settlers, who arrived here in 1639, to learn to relish the seaside delicacy also. And so they named this quiet stretch of southern Cape Cod, Oyster Island Village. In 1648, a delegation led by Capt. Miles Standish negotiated a deed to the area with the Cotochese on behalf of Plymouth Colony, and Oyster Island Village belonged to the English. Later, the townspeople changed the name to Oysterville, and finally, in 1815, they voted to shorten it to Osterville, and so it remains. Perhaps the most distinctive feature of Osterville is the presence of the Croby Yacht Yard, which is known worldwide for building superior catboats, Wianno Juniors, and Wianno Seniors. Pres. John F. Kennedy’s Wianno Senior, seen in photographs across the globe while he was in office, was crafted and stored here. It all began in 1850 when C. Worthington and Horace S. Crosby went into the boatbuilding business on the advice of their father, Andrew Crosby. Actually, it was their father’s ghost who made the suggestion to their mother, spiritualist Tirzah Lovell Crosby, who relayed it to her sons. They heeded its counsel and set up shop on West Bay. Their first boat was christened Little Eva. Though most villagers did not make their living by building boats, many of them went to sea at an early age as cooks or cabin boys. The most talented and intrepid rose to captain their own schooners. Some sailed regularly to the West Indies and even China in search of whales or goods to trade. Those who stayed on land farmed, opened small businesses, educated their children, and kept the home fires burning. 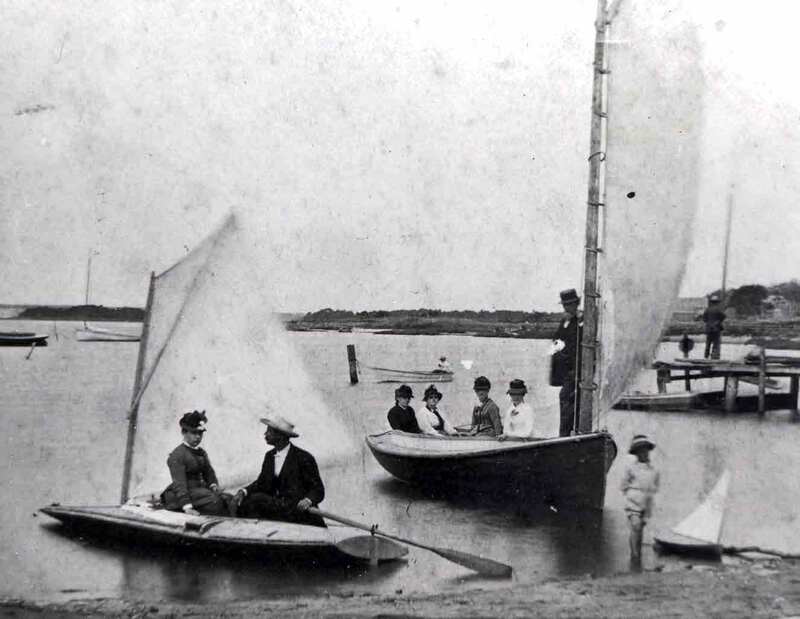 Around the mid 1800s, word got out to the rest of the world that Osterville was a cool and beautiful spot to spend the summer. Wealthy families, mostly from Boston, began to visit, and several Osterville families who had large homes created guesthouses. Before long the families began building their own summer cottages and invited their friends to do the same. Within just a few years, there arose three exclusive summer neighborhoods, Wianno, Seapuit, and Oyster Harbors. Today, Osterville is home to people of many histories and many lifestyles, and the village has been enriched by their heritages. 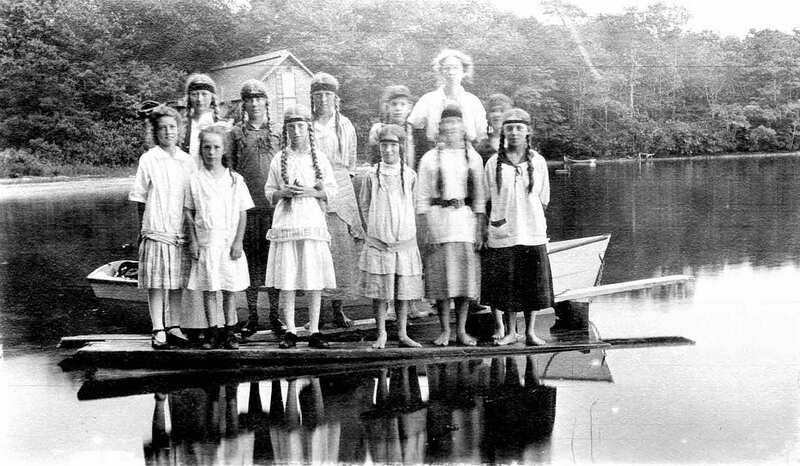 Their stories are being preserved by the Osterville Historical Society, which was founded in 1931 by Dr. Fritz B. Talbot, a Boston pediatrician and a summer resident of the Wianno section. Five other residents were charter members, J. Milton Leonard, Genieve Leonard, Margerie Leonard, Sarah Boult, and Minnie Alien. J. Milton Leonard was elected its first president. Since 1961, thanks to the generosity of Gladys Brooks Thayer of New York and Oyster Harbors, the society has been based in the stately Capt. Jonathan Parker House, which was built in 1824. Since 1979, the Osterville Garden Club has planted and maintained the society’s authentic colonial and herb gardens. Excerpt from Images of America, Osterville, by Shirley Eastman available at the Osterville Historical Museum Gift Shop. Copyright 2006 by Shirley Eastman.